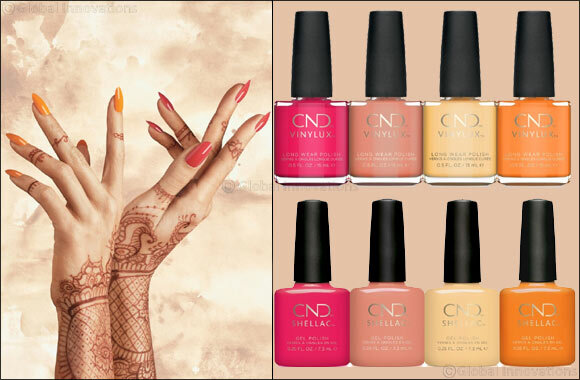 Dubai, UAE, May 15, 2018: Upbeat and highly pigmented shades of red heat up the new Summer 2018 shade collection, Boho Spirit. The tones evoke thoughts ofwarm sunsets inindie orange and desert rose. Combinations of dark ginger and fiery coral brighten up the medley of colors. Contemporary yet rustic, Boho Spirit is a versatile mix of sun-kissed tones that reflect the fervent energy of Summer. Availability: May 2018; Visit the Salon Locator on CND.com to find Shellac Brand Certified Pros. Featured Benefits: Delivers 7-day wear, gel-like shine and fast-drying color in a 2-step Application; CND™ Vinylux™ Long Wear Polish top Coat features increased durability when exposed to natural light.